Good morning Tokyo! Or as the Japanese say, Ohayou! (Sounds like Ohio). In the morning of June 4, we went to Meiji University to listen to guest speakers Professor Gayle Sato and Mr. Wayne Graczyk. We left late for being early so we sped-walked over there. Someone told me that Japan is not the same as in the anime and that I would not see girls running late to class with bread in their mouth, but today I got to see our very own Joyce speed-walk to school while eating bread. Close enough, art reflects life. 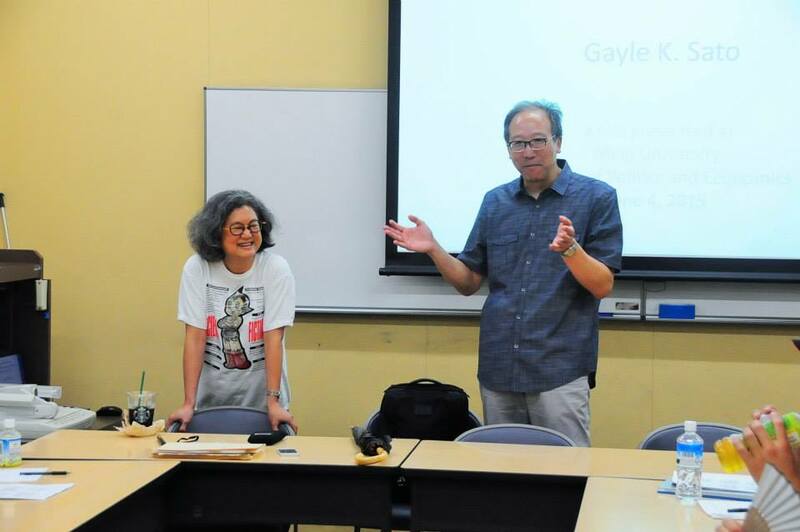 When we got to Meiji University, we listened to Professor Gayle Sato. She discussed her Japanese American heritage and how she became a professor in Japan. She discussed the differences between the Japanese and American education system. I was very surprised to hear that Japanese high school students have to decide what major they want to specialize in before they enter college and that it is very hard to change major or have more than one major. I am very grateful that I study at USC, and that I am able to pursue a Human Biology and East Asian Languages and Cultures major and a Cinematic Arts minor. Professor Sato mentioned how that some universities such as the Tokyo University have adopted the American system for certain departments. That’s good to know. If I were Japanese I would want to go to Tokyo University, assuming that I was a strong enough candidate to enter the school. She also discussed the difficulties of being Japanese American. Because she is Japanese American she is called Professor Gayle, even though the other professors are called by their last name. Furthermore because she looks Japanese she is expected to speak perfect Japanese and act like a proper Japanese woman. She said that being discriminated as a Japanese American is difficult, but she also says that she loves Japan and being in the academic college setting, so she plans to retire there. That’s good to know; I too want to live or work in Japan one day. After Professor Sato’s lecture, other USC students and I went to go to the Meiji University cafeteria to eat lunch. It was very different from USC’s all you can eat buffet style dining halls. It was more like a school cafeteria you see in the movies where you chose what you want. What was really good was that they had a variety of ramen, udon, rice, and pasta dishes for about 400 yen (less than $4). There were also many drinks you can choose from the vending machines and ice cream too. I decided to get the curry udon. Although school food in general has a reputation for tasting bad, I thought it was delicious. The cafeteria was very convenient, economical, and ordering was very fast and streamlined. It was very foreigner friendly because outside had plastic models of every food and the students were very nice and open to help if I wanted to ask them something. I definitely felt omotenashi (Japanese hospitality) in the dining hall. I can see that Japanese people are raised to be polite and courteous to others. Even though I’m a foreigner, I felt very respected. After lunch, we listened to Mr. Wayne Graczyk’s talk about his experience working as a foreigner in Japan. Mr. Graczyk is an American who writes English articles about baseball for a Japanese newspaper. He talked about how he got his job back in college when he read a Japanese newspaper’s baseball column and corrected the mistakes it had. The newspaper company saw that he was very knowledgeable about baseball and asked him to write about baseball for them. He also discussed how foreign baseball players are like “hired guns” because they are hired to do a certain job. The typical Japanese baseball player can not hit home runs or throw really fast balls, so often times foreigners are hired to do those jobs. It was interesting to find out that foreign players often times gets paid more than Japanese players and that there is a limit of 4 foreign players playing on field at one time to balance the game. This wage discrimination is very interesting because it resonates with Dower’s concept in War Without Mercy, how that during World War II although the Japanese demonized western leaders by making them look like monsters in propaganda, they respected westerners to an extent because of their military strength and technological advancements. After all, it was the Prussians and other military leaders from the west who helped Japan militarize their navy and army. Today something similar is happening: the Japanese baseball teams are bringing in foreigners to help their team throw fast balls and make hard hits. I suspected that there might be some complaints with Japanese fans and players with the rising number of foreign players with higher pay checks; however, Mr. Graczyk said that there was little to no conflict between the players because there is a limit of 4 foreign players that can play on field at a time per team. Regarding foreign players in baseball, one of the students asked Mr. Graczyk why both foreign and Japanese players’ baseball jerseys are written in English rather than katakana (the alphabet the Japanese use for foreign names and words). He said that one of the big reasons why he thinks that English is written on jerseys is because the Japanese respect Major League Baseball and that baseball is an American game. I find this peculiar because not everyone in Japan speaks English well. Furthermore, Mr. Graczyk explained that it is not expected for a player to know Japanese. In other words, foreign players just need to know how to play the game and they will have translators to be their ears and mouth. A major concept in Dower’s War Without Mercy is that racial differences creates sides (self or other, ally or enemy, Japanese or foreigner) and this causes stereotypes and misunderstandings to the extent that people will kill each other. This reminds me of the film Mr. Baseball because the main character Jack Elliot often misunderstood how to act in Japan and was also misunderstood by his Japanese teammates and manager because of the culture and language barrier. Instead of killing each other, they often fought in the film. Mr. Graczyk assured us that currently the way foreign players are treated is not like the way foreign players were treated in the film Mr. Baseball and that they are respected members of the team. Another student from USC asked Mr. Graczyk if he felt if he was discriminated in Japan. Unlike Professor Sato, Mr. Graczyk said that he felt little or no discrimination as a foreigner in Japan and that he is doing what he loves as a career. Then again, he is a man who works in a completely different field than Professor Sato. So the rules of the game are different. From these two speakers, I found out that it is possible for me to follow my dream to work in Japan. Even though I will face challenges because I am an American, it is very possible for me to be successful in Japan. The misunderstanding that comes from cultural and racial differences goes with my research on the use of English on Japanese T-shirts. I noticed that many shirts with English on them are associated with American pop culture and quotes from American celebrities like Lady Gaga. I think it is good that the Japanese enjoy the same entertainment that I enjoy. However, I believe that if the Japanese only associate American culture with entertainment, that could also cause misunderstandings and conflicts. Many Japanese shirts that I have seen written in English usually have lines about partying or having fun. One of the many English shirts I have seen while in Japan says “Play Hard Life Slow.” It seems like the United States has a reputation for partying. I disagree because the majority of Americans do not party. Future discussion could explain to Japanese people that America is more than just what they see on TV. It is like when I try to explain to my friends that USC is more than just a party school, but they insist that it is because of the small part they see. In my future research, I will investigate why Japanese associate American culture with party culture and why they decide to wear shirts relating to the partying life. 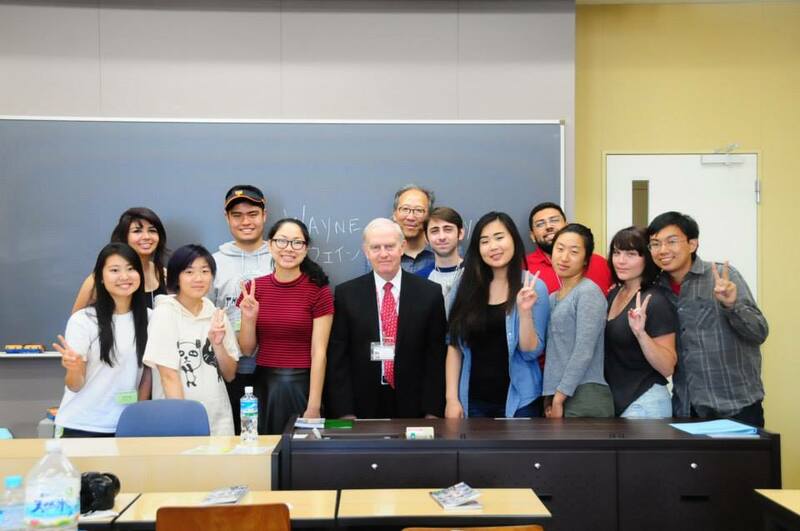 Wayne Graczyk gave a very insightful lecture on baseball in Japan. Fight on! 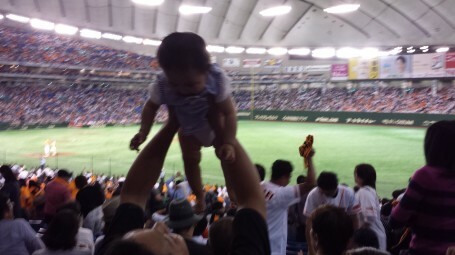 After Wayne’s speech on baseball, the USC student’s and I went to the Tokyo dome to watch the Tokyo Yomiuri Giants face off the Osaka Orix Buffaloes. We had free time before the game so some of us went to Tokyo Dome City, which is the amusement park next to Tokyo Dome. 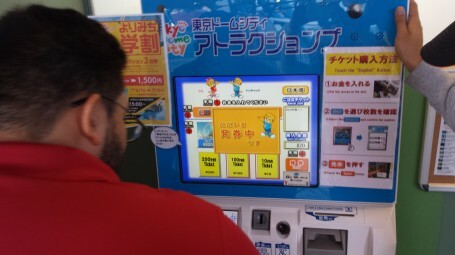 In Japanese amusement parks, you pay per attraction which is usually 800 yen (A little under $8) or you can buy a day pass for a little under $40. Luis and I bought day pass while Eric paid per ride. 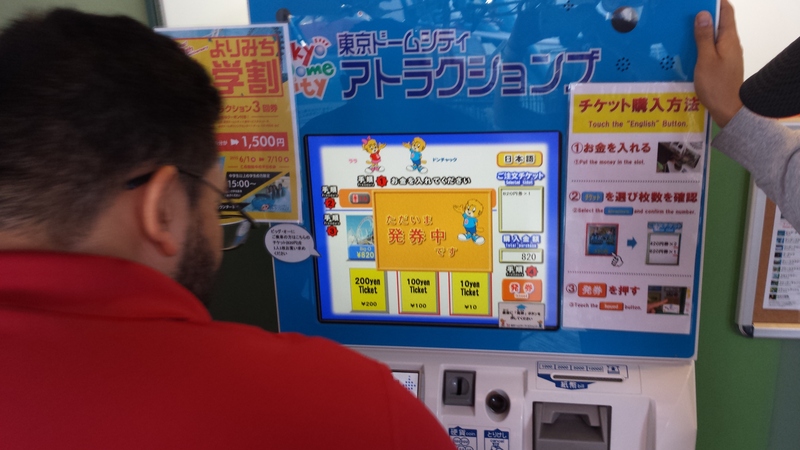 The ticket machines were very easy to use because it was mostly numbers and pictures. There was also an English option for English speakers. In Tokyo there is an English version of every sign and most ATM machines have an English option. I heard about how easy it is for a foreigner to go around before I went to Japan. After going to Japan, I can see for myself that it is because of the English on every sign and the willingness for Japanese people to help others. Buying tickets for the rides was easy because the prices were clearly labeled and there is an English setting. When we went to the game, I was in awe to see the energy of the fans. Every baseball player on the Giants had their own fight song and cheer. Something interesting is that the fight songs for not only the foreign players, but also the Japanese players were sometimes English songs. It is really interesting that a little more than half a century ago, anything that was western or had English in it was banned in Japan. Now, English is ubiquitous in Japanese culture. This week I found out that some of the factors that contribute to the coolness of English and western pop culture is the respect that the Japanese have for celebrities and athletes for being strong, independent, and not afraid to stand out. I find this interesting because in Japanese society “the nail that stands out gets hammered down,” meaning that it is not good to speak up or stand out. I find it paradoxical that many Japanese people admire western celebrities even though standing out is not a good thing in Japanese culture. In my future research, I will investigate more reasons why Japanese people admire western culture and whether they consider celebrities from western culture as role models. The night ended well when the Giants defeated the Buffaloes. It was like the ending of a sports movie, the home team came out to hug each other and the USC students also cheered and hugged each other in celebration. Tonight was a good night in Japan and I’m looking for many more good nights. This entry was posted in Class, Culture, Tokyo by geajapan. Bookmark the permalink.